The temporary detention facility at 4800 Ellis Avenues in Chicago was used to house German detainees who were awaiting their final internment orders. The government leased it for use as a detention facility. Eberhard Fuhr was there for several weeks and shares his memories of the facility below. (See also: the Eberhard Fuhr Story) Mr. Fuhr believes it was used to detain internees from July 1942 until November 1944. Little other information is available at this time. 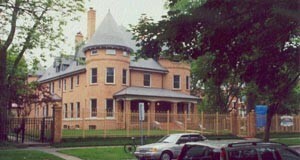 “The old mansion on Ellis Avenue had and still has a six foot wrought iron fence around three sides. There was a guard house next to the front door. All the guards were armed and would run off people who approached the fence. The main floor had a huge main room about 30 x 30, where we assembled at two guard shift times to be counted. It also had several smaller rooms serving as offices. I recall that on Easter Sunday 1943, there were 34 inmates in a service conducted by Father Schmuecker, a Roman Catholic, and Father CuCu, an Orthodox Romanian, both inmates. The maximum population was approximately 50, all German detainees, plus two Italians. The kitchen was of generous proportion presided over by a “contract” cook whose food was mediocre at best. Next to that was a “butler pantry” equipped with stainless steel countertops, expansive cabinetry and storage for canned goods, bread etc. The basement was used for meal preparation performed by rotating “details.” Those “details” washed dishes on the main floor. The back stairway from the upstairs bedrooms down into this pantry made it possible for us to commandeer rye bread for the goodies that visitors brought. Unlike me, the other detainees were mostly from the Chicago area and got frequent visits. They shared their booty with us as long as we could find the bread for the wurst und kaese. From the main floor assembly area, the living room, there ascended a wide staircase with two turns. The woodwork was all oak of high quality workmanship. The second floor was all bedrooms off a center area meant originally performance or dance area. Floors were uncovered hardwood, oiled, not finished. There were 6 or 7 bedrooms, each with a tiled bathroom permitting tub or shower. Each bedroom had four Army cots. They were steel and had thin mattresses on a metal suspension system, like the GI beds in Crystal City and on Ellis Island. Beds had to be made by breakfast time, with “hospital corners” using only the khaki blankets issued. You were permitted to sit on the bed only after lunch time. Night stands were orange crates. The third and top floor was used for recreation. There was a ping pong table there, but when the population exceeded about 25, they used it as a dormitory. We were counted at night in bed at the 11 PM shift change, one hour after lights out. If the count did not conform to the previous shift’s count, they would turn on the lights and recount until they had agreement between the two shifts. There were no curtains, only tan “blinds” which we had to pull down whenever lights were on, because shots had been fired into the bedrooms. As noted, the building has a six foot fence around three sides. The back wall was brick, but only the “garden details,” like me, were permitted in the backyard. In the back northwest corner was a carriage house two stories high, about 40 x 40 feet, which was used for storage by the administration and for gardening tools and equipment. It also had a big locked cabinet filled with guns, which we gardeners observed one day when it was opened in our presence, perhaps by mistake. I requested the garden detail in order to get out of the confined space inside. I believe the mansion was built about 1890. The University of Chicago is located five city blocks away, ironically where Fermi conceived and built the first atomic pile which became the atom bomb ending WW II. It is located in a neighborhood of mansions originally built for Chicago industrialists. In the 1940’s, it was a declining area. Now each of these “mansions” is being refurbished, some into multiple units, and prices have soared. 4800 S. Ellis went on the market for $2.6 million.” See also Arnold Krammer, Undue Process: The Untold Story of America’s German Alien Internees, Rowman and Littlefield, 1997, p. 87-88.